We just got our credit card bill in the post recently. That reminded me of the purchases we made while we were in Japan. Here, I’ve even taken a photo of it all. Well, most of it. On the upper left corner of the photo is a cute small green toy from toy manufacturer, Tomy. We bought this in KiddyLand along Omotesando near the Harajuku station. What attracted me to it was that it swayed its head from side to side all because there was bright light shining on it. Yep, it’s a solar powered toy. No batteries required. There were a variety of these animated solar toys and I wanted to buy them all. But since I really couldn’t do that, I had to settle for this one which we both thought was the cutest for sale. I bought the fully posable Saber from Fate / Stay Night, a popular Japanese game, because this character closely resembles a comic book creation of mine: Nadine Strange. 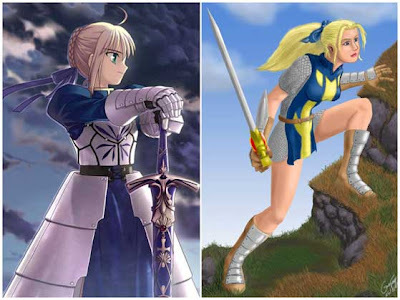 The resemblance between the two characters were so uncanny to me that I thought somebody ripped off my Nadine character design when I first saw images of Saber. It was only later I found out that it was actually a character from a game. Anyway, now I have an action figure that resembles Nadine as a bonus. Look at the similarities below. Admittedly, Saber was better drawn than the drawing I have of Nadine here but you get the picture. As for the books, we so loved the Japanese food while there, we bought a Japanese cookbook at Narita Airport just before I flight back to Melbourne. The funny thing was that the book was actually available in Australia for cheaper. Ah, well. You can also see here two white square books. These are actually colour pencils instructional art books. I bought these because I was attracted with the book’s art style using colour pencils. The downside was that it was written totally in Japanese. I hope to be able to read these books someday and that hope is fueling my desire to become fluent in Nihongo (Japanese). Trying to translate these books word for word by looking at Kanji and Japanese dictionaries would take forever (or thereabouts). So, I figured that learning the language might actually be a faster way to go. Plus, I’ll be able to read Japanese manga (comic books) and watch anime (Japanese animation) in the original Nihongo in the future. At the bottom right is a nifty little paper stand easel. It’s as big as a 3.5″ disk in its case. Set it up and it can hold a piece of paper erect. Pretty useful. I have an ordinary looking one at the office. The one in the photo has a cute pig design. Well, we now wished we bought more cool stuff while we were in Japan. There were lots of cool things to buy there. Maybe next time. Hi Vince. I made that digitally using Painter. So, that meant I didn’t use any traditional media. As for artist supplies, there is one near the Flinders Station at Degraves St. There’s also Riot at QV along Swanston St. 😀 Good luck. That’s a nice drawing. What medium is it? Do you have any tips on where one can go to for artist supplies? (Preferably in the city) Colored pencils, watercolors, brushes, acrylics, etc? I’ve seen that solar-powered toy here in Singapore. Comes in different colors and also available in disney characters like Chip n Dale, Minnie & Mickey Mouse. Great for office tables!